Michael Lewis is known for his books Liar’s Poker, Moneyball and The Big Short. 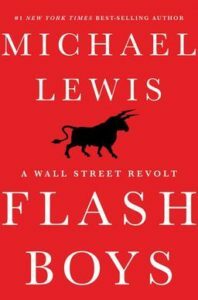 Flash Boys is one of his more recent books, and it’s about high-frequency trading. Even though it reads like a novel, it’s actually non-fiction, with real characters and real events. The book tells the story of how electronic trading replaced trading floor of brokers and the race for reduced latency with the introduction of electronic trading. The story revolves around a few characters. The main character is Brad Katsuyama, a former Royal Bank of Canada trader, discovering that he can no longer buy shares at the prices he sees, and his journey to understand what’s happening in the market that leads him to starting a new, fair exchange called Investors’ Exchange. Overall, the book is really interesting if you’re not very familiar with the finance industry, and portrays the conflict of interest and raises ethical questions about the practices in the industry. Highly recommended if you’re interested in this subject!